Over two and a half weeks in February and March, the 100 grade nine students from CSS selected and read their first choice for "the next great grade 9 novel." Students put together "digital book jackets" to promote their book choices at student-led conferences. 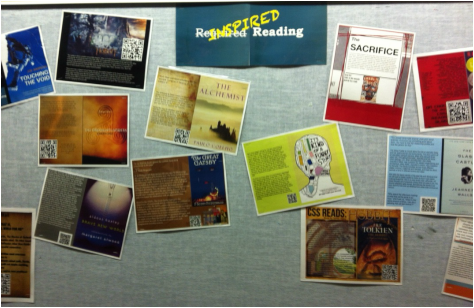 The QR code on each poster links to the student blog that has a novel synopsis and critique posted to help students choose a second book for round 2. The links to each of our classes selections and their blog posts are in the drop-down menu above.